First off… this is a pretty darn impressive plate. Second… I love the swirling, spinning, ever-changing patterns in the colored slip. Third… looks like my Beginner’s will get a new slip demo next class session!!! Click here to watch the beautiful demo video. And seriously, the music soundtrack to the video is pretty incredible too. It makes the whole process “sound” like so much fun too!!! As a person who’s spent more than a few hours at the seat of a potter’s wheel I can attest to the strangely soothing act of doodling around with wet clay sludge (called slip) before or after throwing a pot. 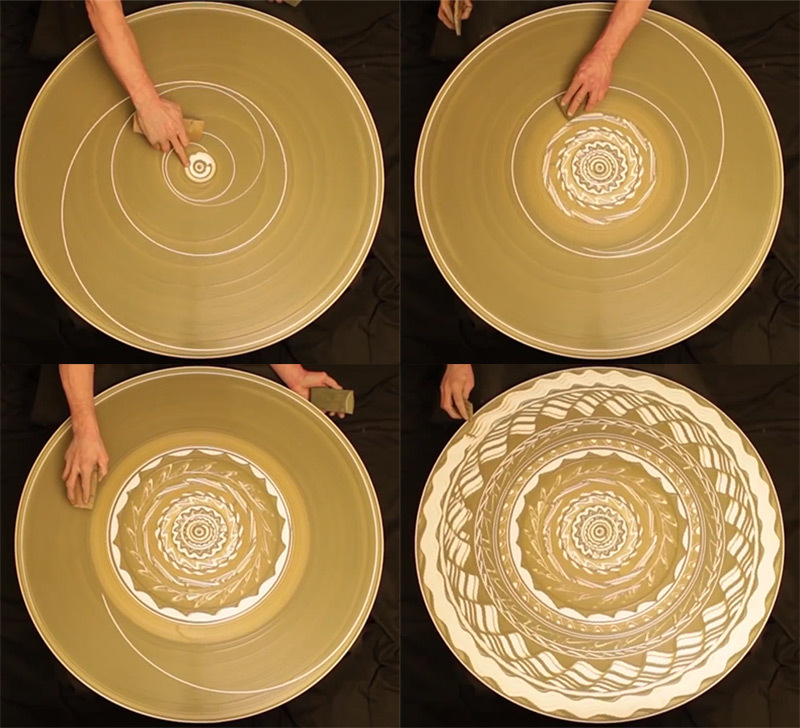 As fun as it is, it’s still somewhat surprising to see the act elevated to this level of artistry by “Michael Gardner” who blurs the line between performance and visual art as he creates pattern after pattern on an empty wheel. FYI: the artist’s name is a Google translation from Russian via YouTube, if anyone have more concrete details on the performer/artist, send it over. What tool was in his left hand?? I want to try it too!!!! LINDA – I’m not quite sure. I think he’s using the fingertips on his right hand to make most of the patterns. And then in his left hand, I assumed it was some sort of slip-soaked sponge that helps smooth everything out again for the next pattern.